A group of boys play in a dirty channel in Katoogo Zone, Nakawa Division in Kampala last year. Cholera outbreak has spread to other parts of Kampala city. Kampala — The Cholera outbreak has spread to other parts of Kampala City as Naguru hospital continues to receive suspected cholera patients. The hospital on Monday recorded six more cases where one from Bukoto, a Kampala suburb, tested positive for the disease. Mr Steven Kyebambe, the head of clinical services at the hospital, said all the six patients showed signs and symptoms of cholera though they are awaiting final results from Central Public Health Laboratories (CPHL) in Butabika. "We have six patients in isolation centre now. One child, three women and two males. They all showed signs and symptoms of cholera. Since the outbreak, we have dealt with about 20 patients regarding cholera," Mr Kyebambe said. Other patients are from Kireka, Mutungo and Ndeeba, among other city outskirts. Ministry of Health said they are scheduled to sensitise people in the entire Kampala about the cholera disease. "If there is a case that tested positive, then the person will have to be handled by the hospital. We are going to sensitise the entire Kampala about the disease," Mr Emmanuel Ainebyoona, the public relations officer in Ministry of Health, said yesterday. The cholera outbreak started in Kabowa Village in Rubaga Division this month. 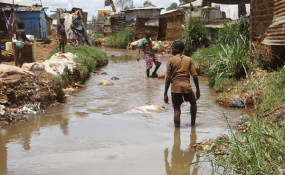 Last week, Ministry of Health confirmed seven cholera cases and one death in Kampala. Mr Kyebambe said all the seven patients, who had been confirmed with cholera, were treated and discharged. Cholera is an infection caused by bacteria and affects the intestines. The main symptoms are diarrhoea, dehydration, vomiting and loss of skin elasticity. This may result in dehydration. It is usually contracted through drinking water or eating food that has been contaminated with faecal matter.